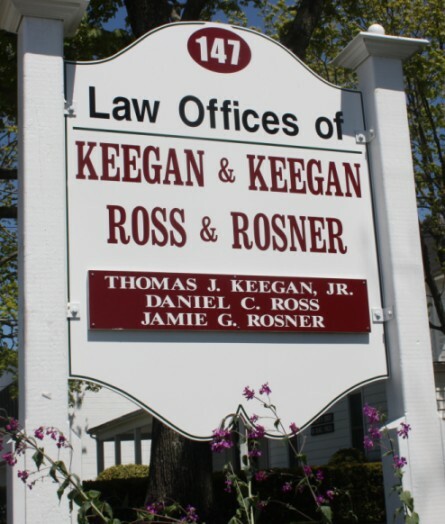 Welcome to the online home of Keegan & Keegan, Ross & Rosner, a full-service personal injury and general practice law firm with offices on Long Island, NY in Patchogue and Mattituck. Our attorneys have served clients across Suffolk and Nassau County in all facets of personal injury law, including motor vehicle accidents, slip and falls, products liability and workplace accidents. The firm was founding by Thomas J. Keegan Sr. and his son, Thomas J. Keegan Jr., in 1978. Today, Thomas J. Keegan Jr. and the law firm’s other partners, Daniel C. Ross and Jamie G. Rosner, carry on in the mission and tradition established by Thomas J. Keegan Sr. In addition to its personal injury practice, Keegan & Keegan, Ross & Rosner provides representation in medical malpractice cases, family court, business law, real estate, municipal matters, collection, elder law, estate litigation, landlord and tenant cases and criminal matters. If you’re in need of a Long Island attorney, we would be happy to have the opportunity to serve you. Having the ability and experience to represent our clients in all of their legal matters allows our lawyers to form lasting relationships and protect our clients from having to maintain an arsenal of attorneys for whatever problems life may present. Visit the firm overview page and practice areas page to learn more about us. You can reach our Patchogue office at 631-475-9400, our Mattituck office at 631-298-1200, or contact us using our convenient online form to schedule a personal consultation about your case. Accommodations can be made for weekend appointments upon request. Para el español oprima aquí.